Trendlines are an important tool in technical analysis for both trend identification and confirmation. Technical Analysis is built on the assumption that prices and the stock market trends. And no matter what market and what period you trade and invest in, you will NOT make money unless you know the direction of the trend and how to identify a change in the trend. A trend line is a straight line that connects two or more price points and then extends into the future to act as a line of support or resistance. Many of the principals that apply to support and resistance levels can be applied to trend lines as well. 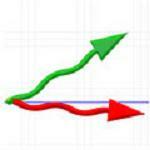 An up-trend is a price movement consisting of a series of higher highs and lower lows. An up trendline has a positive up-slope and is formed by connecting two or more points. The second low must be higher than the first for the line to have a positive slope. Up-trends also act as support and indicate that demand is increasing even as the price rises. A rising price combined with increased demand is very bullish and shows strong strength on the part of the buyers. 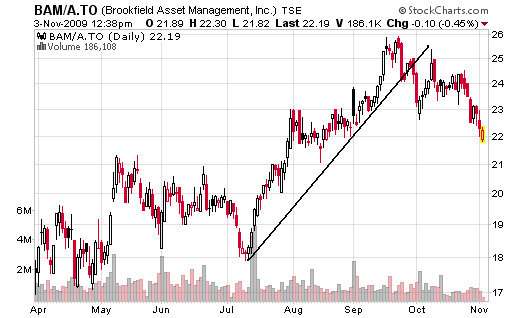 As long as prices remain above the trendline, the up-trend is considered solid and intact. A price break below the up trendline indicates that demand has weakened and a change in trend may be soon coming. A down-trend is a price movement consisting of a series of lower lows and lower highs. A down trendline has a negative down-slope and is formed by connecting two or more points. The second high must be lower than the first for the line to have a negative slope. Down-trends also act as resistance and indicate that supply is increasing even as the price falls. A declining price combined with increased supply is very bearish and shows strong strength on the part of the sellers. 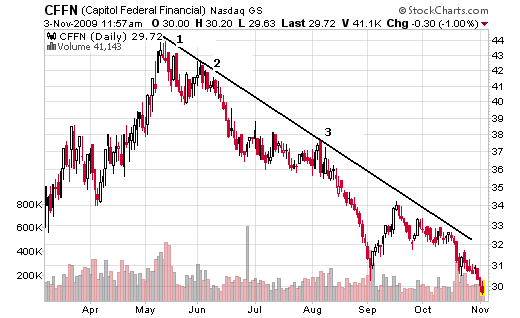 As long as prices remain below the trendline, the down-trend is considered solid and intact. A price break above down trendlines indicates that supply has weakened and a change in trend may be soon coming. 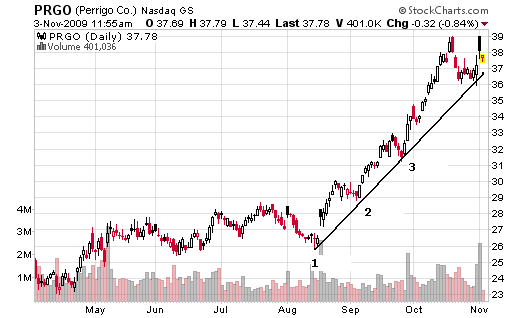 Sideways price movement, also called consolidation and a trading range, and a rectangle stock chart pattern. It is when a market does not trend. Prices over a period of time move within a relatively tight sideways range. This means that the forces of supply and demand are evenly balanced. Again, 2 or more points on both the price highs and lows are required to confirm the sideways trend. It takes two or more points to draw trendlines, and a third point to confirm the actual trend is true. And the more points used to draw the trendline, the more validity attached to the support or resistance level represented by the trendline. The most important feature of trendlines is its angle and slope. 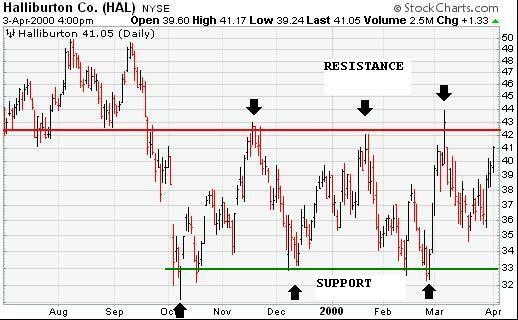 As the steepness increases, the validity of the support or resistance level decreases. In other words, if the stock price breaks a steep trendline, it may or may NOT be a valid change in trend. On a sideways trend, a break above or below support or resistance usually means that it is the real deal. For trend trading, the longer the timeframe of the trend, the more important the trendline. Trendlines on a weekly chart identifies a more important trend then the daily trendline. Trading volume plays an important role when trend trading. The breaking of a trendline shows that the dominate market crowd has lost its power. But you have to be careful not to anticipate trading signals…most stock traders lose money when they jump the gun. A trendlines break is only valid if the price closes on the other side of the trendline, as shown on the stock graph above. After a very steep uptrend is broken, prices often rally again, retest their old high (or low) and touch their old up-trendline from below. When that happens, you have a near perfect shorting opportunity. Return from "Trendlines" to the Home Page: "Stock Market For Beginners"